US - Last week’s monthly Cold Storage report from USDA was viewed by the trade as bearish for beef and chicken and neutral for pork. 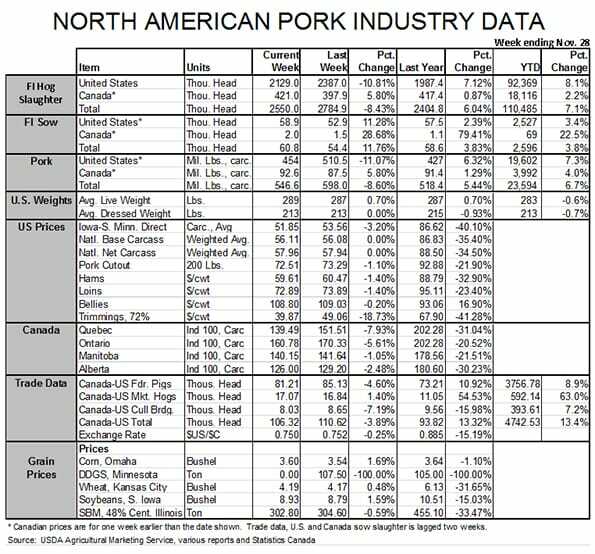 The data for all meat and poultry species appears in Figure 1, writes Steve Meyer in the National Hog Farmer. 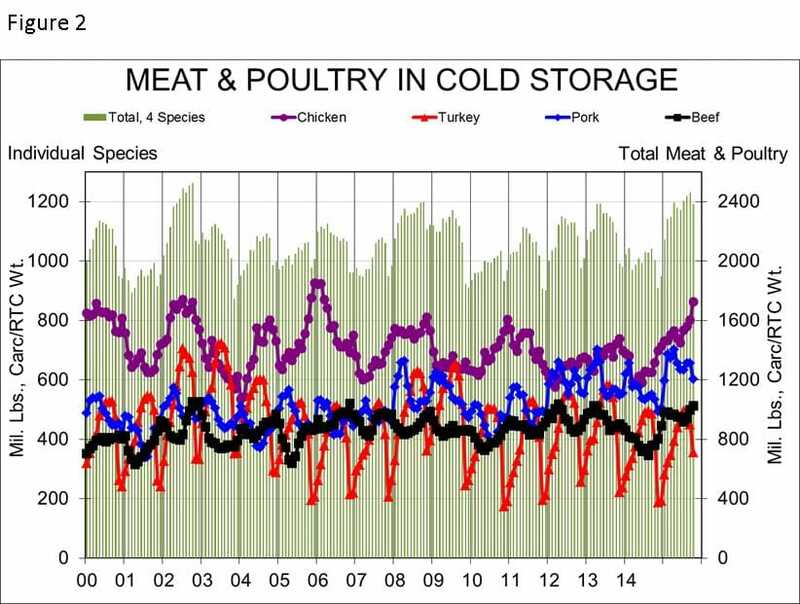 Figure 2 shows our familiar chart of monthly freezer stocks by species. Total frozen meat and poultry stocks on October 31 amounted to 2.386 billion pounds, 3 percent lower than one month ago but 18.1 percent larger than one year ago. That total ranks 13th on the all-time frozen inventory list. September’s total was the 5th highest ever. The big contributor to October’s big year-on-year change was chicken stocks. The October 31 level of 862.7 million pounds was 31% higher than one year ago and 7.7% higher than one month earlier. That total trails only the record-high levels of 2002. Stocks of only whole chickens and paws and feet were lower than one year ago and no one category of chicken products was to blame for the increase. Stocks of leg quarter products – whose exports have been negatively impacted by HPAI-related trade challenges – were 32% higher than one year ago while breast meat stocks were up 29%. Turkey stocks took their normal October dive, dropping over 20% from the end of September. The 356 million pounds in freezers on October 31 were nearly 9% lower than one year ago – one impact of this past spring and summer’s HPAI losses in Minnesota and Iowa. Beef inventories continued to increase in October, growing 2.7% from the end of September to 511.6 million pounds. That total is 34.3% higher than last year and is almost completely due to higher stocks of boneless beef. This increase has been driven by a large increase in boneless beef imports, an increase fueled by the need for grinding material as cow slaughter has fallen during the recent increase in the cow herd. 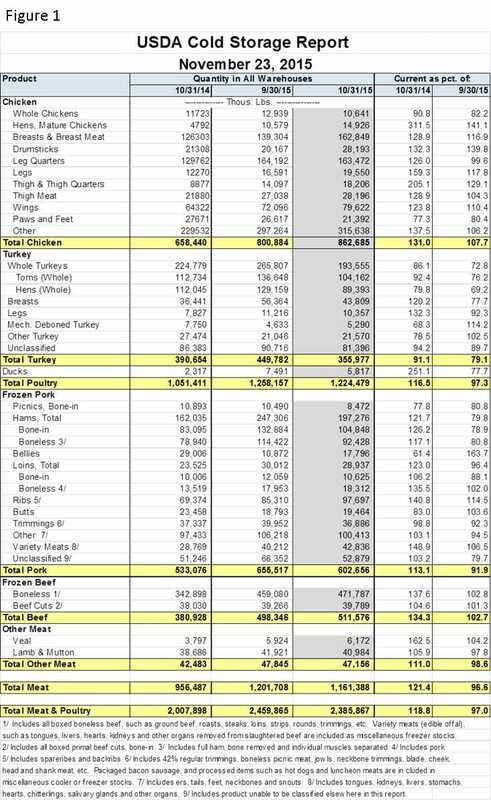 Though USDA data do not provide any details, we believe the increase is also attributable to much higher levels of fat trim from record-large slaughter cattle. Pork inventories actually declined by 9% in October but remained significantly larger (13.1%) than one year ago. The October decline was driven by a large (50 million pounds, 20%) reduction in ham inventories. Though normal in its pre-holiday timing, that is the largest October reduction in ham inventories since at least 2005. We find that encouraging for either October domestic pork consumption or October exports or both. We will get data late this week on October exports that will clearly answer those questions. Bellies stocks grew sharply (+7 million pounds or 64%) in October but we must remember that September’s belly stocks were extremely tight. Oct. 31 bellies stocks remained 39% lower than one year ago. It will be interesting to see the behavior of bellies inventories during the big November price break when the Nov. 30 data is released in late December. Was the break driven by an inventory liquidation or did bellies producers build inventories in the face of the price decline? 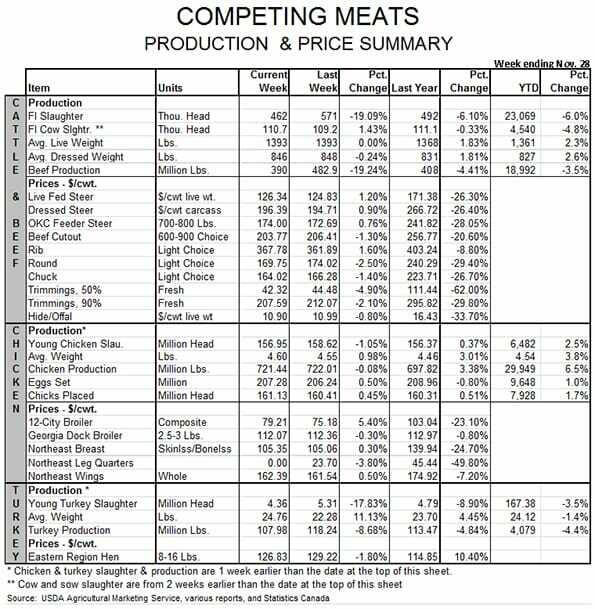 The bottom line for the report is that there is plenty of meat/poultry protein available as we near the end of the year. Higher pork production, recent increases in beef production due to very heavy cattle and growth in the broiler sector are all contributing to this larger supply. Just as consumers were the ultimate victims of the cost-induced reductions in supply in 2006 and 2007, they will eventually be the beneficiaries of these increases. It takes time to pass lower farm and wholesale costs along to the retail level and they never get fully passed along but we are confident that lower consumer-level prices are on their way.